The best bang for your bucks! Harponline is German store directed by Michael Timler, a major actor of the harmonica industry. 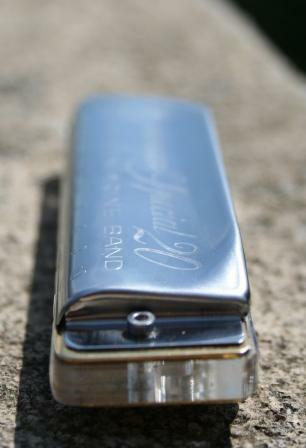 Michael is a musician who created Harponline following his encounter with Classical Harp Player Franz Chmel as they both thought there was definitely something to do regarding harmonica maintenance. Harponline was the first (and probably still the only one) store to provide individual reeds and valves for all Hohner harps. After a time at Seydel as a sales manager, Michael came back to Harponline and pushed its original concept further, proposing additional options like "Fine Tuning", "Overblow Setup", "Smooth Edges" "Harponline quality checked" (see http://www.harponline.de/ for details) and semi-customised harps, which provide an excellent quality level for a moderate price. This strategy, plus Michael's dedication to customers satisfaction definitely ranks Harponline among the top Harp Web Stores. Probably Harponline' best original idea is to create an hybrid of Special 20 (covers) and Marine Band (reedplates), with an extremely well designed translucid comb. The harp is really beautiful, the finition is excellent. Its rounded edges and it small size (slightly smaller than a Special 20 comb) make it extremely pleasant to hold. The front grid is smooth, which eases the Tongue Blocking. As all the Harponline harps there is a strong focus on maintenance and the reedplates are screwed to the comb. Plus the small tool delivered with the harp to screw/unscrew is quite handy for reed gapping! The first run reveals a surprisingly airtight instrument, similar to many customised harps (obviously the harp benefits from its very flat comb). As a result the harp answers to the smallest blow, the sound is powerful and malleable (special mention to the first three holes), the bends are clean and the overblows are easy to obtain and to sustain at low volume. The natural notes can still be attacked quite hard. Very airtight, responsive and easy to bend. Measures to many Customised Harmonicas!